8:30-8:45 a.m. Welcome - Edward Owens, D.C.
Why Come?The thrill of learning something new, or gaining new insight into something you do every day, is one of the most rewarding outcomes of intellectual discourse. Here, field D.C.s will present fascinating scientific information within the context of how it applies to practice. Special sessions will review research methods that can be used to collect data from your own patients.You will learn the latest information about subluxation measures, how to demonstrate the effectiveness of care and methods of researching the effects of vertebral subluxation and hear from Robert Leach, D.C., author of the widely used textbook The Chiropractic Theories. Continuing Education Department, 800-849-8771, ext. 1229, for specific state details. Directions to Sherman CollegeFrom Greenville: Take I-85 North, follow the bypass toward Charlotte. Take Exit 72-Inman and Spartanburg. Turn left onto 176 toward Inman. At the first traffic light, turn right onto Springfield Rd. Sherman College is approximately 1-1/2 miles on the right. The Chiropractic Health Center is at street level and the Administrative Building is on top of the hill, where visitor parking is available.From Charlotte: Take I-85 South, follow the bypass toward Greenville. Take Exit 72-Inman and Spartanburg. Turn right onto 176 toward Inman. At the first traffic light, turn right onto Springfield Rd. Sherman College is approximately 1-1/2 miles on the right. The Chiropractic Health Center is at street level and the Administrative Building is on top of the hill, where visitor parking is available. Background: Chiropractic literature views the dysfunction of the upper cervical motor unit as the component of the Subluxation Complex that is directly addressed by the specific adjustment. Methods for accurately assessing the function of upper cervical motor units immediately before and after adjustment interventions, allow the practitioner to be more precise in achieving the most desirable treatment outcomes. Objective: This discussion describes an analysis method that combines computerized compliance testing with motion palpation procedures. The purpose is to demonstrate how it is possible to correlate findings of the two testing procedures to determine probable level, side, and vectors of fixation. A flow chart is developed to help integrate this method into individual technique systems.Discussion: The computerized compliance instrument and the method in which information is collected is described. The examiner accepts the computer data for level and side of involvement as accurate. Motion palpation is used as a manual compliance test to analyze other fixation vectors.Conclusions: Computerized compliance testing has a high degree of inter- and intra-examiner repeatability. It may be used with standard methods of motion palpation to evaluate and monitor the kinetic component of the VSC. The findings may be combined, resulting in a fixation subluxation listing based on movement dysfunction. Further studies in this area may lead to correlation with x-ray listings used in various techniques. With computerized recording and storage of data, this system delivers reliable outcome assessment that is in line with classical chiropractic concepts. Triaxial assessment of extreme end-range foot posture: a novel method of leg checkingRobert Cooperstein and Joe Pigg The traditional chiropractic leg check assesses relative distal leg positions (Y-axis translations) to identify subluxations and monitor outcomes. The tendency of the feet to assume asymmetric rotational positions in dorsiflexion/plantarflexion, internal/external rotation, and inversion/eversion, has been generally assumed to confound LLI determination, often requiring the examiner to grasp the feet to manually remove these other asymmetries. To test the assumption that these other elements of non-weight bearing foot posture amount to mere noise, the investigators constructed a triaxial foot posturometer. It consists of two orthogonally placed inclinometers and a compass mounted on a surgical boot, screwed to a wood "footprint." The experimental protocol involved a blinded examiner taking the subject's feet to the "extreme end range" (using force well beyond what is usually applied to measure passive ROM) in both directions around each of the 3 orthogonal axes, while other examiners read the gauges and recorded data. This produced 12 measurements per subject, per trial. In a pilot involving 5 subjects, each of whom were tested twice, a robust tendency was detected for increased external rotation (on the side of apparent LLI), ipsilateral inversion, and contralateral internal rotation inversion to covary. Forced end-range rotational asymmetries appear more easily measured and reproducible then conventional LLI measurements, and could ultimately mark an advance in leg checking procedure by serving as a superior surrogate measure. The investigators are just about to conduct a larger study based on the pilot, and will present the data at the subluxation conference. test the intra- and inter-examiner reliability of muscle palpation by carrying out cross comparisons of results gained from palpation of patients in the health center. test the validity of muscle palpation by testing the effects of adjustment on palpation findings. Three recently trained palpators served as examiners in the study. Each patient was palpated twice by each examiner. In addition, some patients were adjusted between assessments to test the hypothesis that the assessment should be able to detect changes in muscle activity related to subluxation. Assessors were blindfolded so that they did not know which patient was being palpated, or which patients have been adjusted.The palpation results were scored as right positive, left positive or inactive for each of 5 muscles in the cervical spine. In addition, the muscle findings were used by each practitioner to derive an atlas or axis listing, that could be right lateral, left lateral, neutral or inconclusive (conflicting muscle findings). The data was evaluated using 3X3 and 4X4 agreement tables and Cohens Kappa was calculated using a spreadsheet. The results and conclusions drawn from them will be detailed in the conference presentation. Applied Wave Motion into Semifluid Tissue Dr. Thomas R. Elliott, Jr.
ESIInter@aol.com We represent Spinal Orthopedic and Neurological Advancement and Restoration (SONAR) Foundation, a non-profit organization. SONAR's thrust is in five directions: literature search, clinical research, biomechanics improvement, equipment development and teaching. We are presently working on a project with the physics department at the University of Nevada to develop a sonic device to locate specific structures of the bones, providing a more accurate adjusting interface.ABSTRACT The University of Nevada research involves using ultrasonic transducers to find resonance frequencies in soft tissue between skin and bone. Models of the neck and bodily soft tissue were made from tissue mimicking material and pig vertebrae. Resonance frequencies from samples of known dimensions can be used to calculate sound speed. The objective is to find the point of a tissue mimicking sample containing bone at which the highest first resonance frequency is measured, thus finding the minimum distance between the bone and sample surface. Over a twenty year period with the grace of God Dr. Elliott developed the ESI adjusting instrument. The ESI instrument is used to reposition malaligned vertebrae in the human body by introducing both linear and torque forces in the exact angle and amplitude as determined by x-ray analysis. It has a computer-generated digital signal that provides complex multiple frequency energy waves which match harmonic resonances of different sized bones. The ESI instrument offers several advantages. First, the patented kind of force produced by the instrument moves bones with less force and more efficiency. Efficiency translates to gentleness. Efficiency results in quicker recovery and fewer unpleasant recovery symptoms for the patient. Second, the instrument's self-contained aiming system sets up on the correct three-dimensional vector several times more accurately than is possible by hand. Accurate vectors facilitate complete reduction of misalignments. Third, the power levels of the linear and torque components of the adjusting forces can be exactly controlled. With the ESI instrument, power levels are dialed in on ten-scales and are totally consistent and repeatable. With these variables known, accurate research of other individual components of the adjustment is possible for the first time. Ph: 724.733.2277ABSTRACT This paper presents a comparative study of the results of x-ray analysis and Computerized Fixation Imaging (CFI) analysis of the cervical spine. Twenty-five patients seeking chiropractic care at a private clinic were used in the study. This study was undertaken to answer questions from clinicians using the Sense Technology PulStarFRAS (Function Recording and Analysis System). These questions naturally arise regarding the findings of a mature and widely used method of spinal analysis (x-ray) and this new and rapidly evolving method of objective instrumented palpation (CFI). Significant major findings were: Eighty-four percent (84%) overall agreement was obtained between the results of x-ray analysis and the results of CFI analysis. Ninety-three percent (93%) agreement was observed between x-ray findings of arthritic joint involvement and CFI analysis and eighty percent (80%) agreement was observed between x-ray findings of discontinuities of cervical spine curvature and CFI analysis. Therefore it may be concluded that there is a high degree of correlation between x-ray analysis and CFI in findings of discontinuities of spinal structure and in observation of evidence of osteo-arthritis. In addition, the CFI analysis is sensitive to soft tissue differences and the scans reflect the existence of muscle spasm as well as structural or arthritic abnormalities. This finding indicates that the CFI analysis methodology has a significant advantage over x-ray analysis in the detection of muscle spasm and related soft tissue abnormalities. Comparison of Upper Cervical X-ray Listings to Upper Cervical Palpation Listings John Hart, D.C.
Sherman College of Straight ChiropracticABSTRACT This study is just getting underway but it is hoped by the time the conference arrives there will be at least ten to fifteen case studies to present.Participants are being sought from the chiropractic center at Sherman College. The patients are x-rayed using a four-view cervical series. Immediately following the x-ray examination, the patients are examined by two faculty clinicians using different palpation techniques. Neither palpator is aware of the others findings, nor are the two aware of the x-ray findings. Two other faculty clinicians will analyze the radiographs; neither will know what the other's findings are, nor will the two know what the other (palpating) clinician's findings are. The objective is to see how well these two (x-ray and palpation) analytical tools agree regarding the misalignment component of the vertebral subluxation. If they agree 100% of the time, then perhaps one of the tools is not needed regarding its application to the misalignment component of the vertebral subluxation. Anderson RT, Initiating Anatometer research. The Upper Cervical Monograph 1981:2(10); 1,9. Addington EA, Reliability and Objectivity of Anatometer, supine leg length test, thermoscribeII and derma-therm-ograph. The Upper Cervical Monograph, 1983: 3(6); 6-11. Seeman DC, C1 subluxation, short leg and pelvic distortions, The Upper Cervical Monograph, 1978:2(5); 1-5. Seeman DC, A comparison of weight differential between a group that hs a shitory of spinal problems or had been under care and a group that had neither a history of spinal problems nor been under care. The Upper Cervical Monograph 1991:5(2);17-19. ABSTRACTAn ongoing study is being conducted in the private office setting to assess the influence of the upper cervical subluxation and its correction on specific mental functions. 34 subjects have been monitored before and after 4 weeks of upper cervical care via Microcog: Assessment of Cognitive Functioning (Microcog). The population age ranges from 18 to 81 with 22 females and 12 males. Twelve of these subjects have repeated the examination with a 6 to 12 month long term follow up. The long-term group had continuous chiropractic care throughout the study and consisted of 8 females and 4 males, age range between 25 and 64 years. Microcog is a computer-administered and scored test that assesses neurocognitive functions in adults. The instrument is intended as a screening device and a diagnostic tool for use as part of a general neuropsychological examination, or any other clinical examination requiring the assessment of cognitive functioning. Microcog was designed to be sensitive to detecting cognitive impairment across a wide age range and takes into account levels of premorbid intellectual functioning by providing age and education level adjusted norms. However, the subjects in this study are their own controls and their post care results are compared against previous scores and not relative to suggested normative values. Nine categories are scored; attention/mental control, memory, reasoning/calculation, spatial processing, reaction time, information processing speed, information processing accuracy, general cognitive functioning, and general cognitive proficiency. Significant improvements in neurocognitive function have been observed in the short term (four weeks) as well as long term (6 to 12 months) groups. This preliminary study suggests a need for further investigation of the relationship between an upper cervical subluxation and neurocognitive function. INSTRUMENT CERVICAL ADJUSTINGBy Cecil D. Laney, D.C.In Dr. B.J. 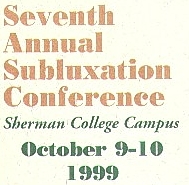 Palmer's research, he came to the conclusion that a subluxation could only occur in the cervical area. If one accepts that concept, he must search for the procedure that efficiently corrects the cervical misalignment.The procedure developed by Dr. John F. Grostic has been proven to be the most successful in not only the cervical correction, but in proving the performance with post-x-rays. Dr. Grostic's method consisted of establishing an adjustment vector, or path through space, for each and every conceivable misalignment. The vector was established by calculating certain anatomical and misalignment factors.The problem was the fact that very few doctors could develop the skills necessary to send force down the desired vector. This led a few doctors to come to the conclusion that the procedure had flaws that needed changing, and they proceeded to establish various modifications or radical changes. Some of these procedures were so different from the original Grostic procedure that it is not recognizable. None have proven to be as efficient as a skillful adjuster using the Grostic vector.Since the accurate adjusting force is so difficult to achieve, and since the objective is to deliver force down a desired path, it is logical that an instrument can be built to perform the task. Many doctors have developed adjusting instruments with varying degrees of success. The most successful have been those who have stayed with or close to the Grostic adjustment vector.The advantages of instruments are many. The doctor doesn't have to have supreme athletic skills to send force down the desired vector. Instruments can be utilized by doctors with certain disabilities. The adjustment can be precisely duplicated.The latest adjusting instrument is the one developed for Life University. It is designed to utilize the Grostic procedure, and will deliver force that theoretically would be delivered by a perfect Grostic hand-adjustment, which includes the function that hand-torque delivers. The Vertebral Subluxation Complex (VSC) is the most widely acknowledged model of subluxation in current use, but its precise structure and organization is often. misrepresented and misunderstood. The model consists of a number of components representing the tissues of the spine integrated into a functional whole. The tissue-level components represent muscle (myological), nervous (neurological), connective and vascular tissue elements. The kinesiological component represents the functional aspects of the tissue components and the inflammatory component represents the transition from normal to abnormal states. Our understanding of these components rests solidly on the basic sciences of anatomy, physiology and biochemistry (foundation principles).The evolution of the VSC model is traced from the simplistic concept of "bone-on-nerve" through the early VSC models to the present state-of-the-art in subluxation theory. Specific details of the evidence supporting the chiropractic concept of subluxation will be presented, including the concept of "immobilization degeneration".Although the details of the components are sometimes controversial, the basic structure and organization of the model has withstood even the harshest criticism. Consequently, the model provides the student and practitioner of chiropractic with a valuable tool to present and defend chiropractic principles and practice to other professionals and to patients.The practical application of the model in clinical practice will be presented as a mapping of each component from basic science knowledge to evaluative procedure to interventions, thus making the VSC a useful model for organizing chiropractic curricula, as well as clinical management of subluxation dysfunction. Evidence of Facilitative Vertebral Subluxation: Biological Events or Mimicry Robert A. Leach, DC, FICC Modern theories of the effects of vertebral subluxation upon health center around the concept of a facilitative spinal lesion which impacts upon either visceral or somatic neuronal pools. Sympathetic influence on norepinephrine release which is associated with decreased plasma extravasation in the short term but with increased severity of disease in the long term is one example of the considerable role that neurophysiologists argue the nervous system plays in inflammatory disease. Certainly modulation by the nervous system of sympathetic postganglionic neuron activity would affect the development, severity, and longevity of tissue injury. The challenge to this area of chiropractic theory does not appear to be whether or not spinal lesions promote facilitation of neuronal pools, but whether or not this facilitation-whether by visceral or somatic inputs-can actually cause tissue injury in specific organs of the body. Some researchers propose that these events do not instigate actual somato-visceral disease, but rather trigger somatic stimulation syndromes which were previously referred to as referred pain. In this view chiropractic may relieve angina symptoms, for example, because the patients pain is not due to a coronary problem but due to somatic mimicry caused by a spinal lesion. Chiropractic clinical research of the organic pathophysiology associated with facilitative vertebral subluxation must clearly document-using state of the art diagnostic procedures-that indeed an organic component is present. Post-chiropractic evaluation must clearly demonstrate reduction in that organic component using those same diagnostic tests. Only then will the pathophysiological biological sequalae of this lesion be clearly elucidated. In sum, we must clearly clinically define what is well from what is dis-ease, using state of the art technology, before we can establish that elimination of the facilitative vertebral subluxation promotes wellness. The Mears Technique D. B. Mears Jr. D.C.
AbstractThe Mears Technique is a specific upper cervical system of X-ray analysis and adjustment that carries on where the H.I.O. concept ends.The developer of this technique, Dr. Donald B. Mears Sr., D.C. PhC., was a 1927 graduate of Palmer College. He was a strong advocate of the H.I.O. technique and practiced it exclusively for a number of years. In time however, he became somewhat dissatisfied with the inconsistency of his results and could not understand why in similar cases one would dramatically improve and one would not respond.The conclusion he reached was simply that in the case that responded positively, the adjustment given had removed the causative nerve pressure and had not done so in the unresponsive case. If this assumption were correct, then it seemed only reasonable that some indication of vertebral displacement would be evident on X-rays of the cervical spine. With the above in mind, he began to analytically review past X-rays taken of the cervical area, and noticed that the disrelationship occurring between the Occiput and the Atlas did not always appear to be the result of Altas displacement as was assumed in the H.I.O. analysis.As a result of continuing this line of investigation, a new method of X-ray analysis evolved which established more reliable points of reference to determine cervical distortion more accurately. This in turn led to the need to modify the adjusting procedure used in the H.I.O. technique. The new X-ray analysis indicated that segment rotation was a major factor in cervical distortion and it became apparent that a method of adjustment had to be devised which would correct rotational as well as lateral displacement. What developed was a new method of adjustment which with the X-ray analysis became the basis for the Mears Technique. Field doctors interested in carrying out research in a practice-based setting are limited in the ethical research designs they can use. Randomized controlled trials are considered the strongest research design in terms of hypothesis testing, but they are difficult to perform in a practice because of the need for a control or comparison group. Case studies are easy to perform, but are usually considered low in scientific quality. The time-series design, on the other hand, is quite appropriate in this setting and also can provide strong evidence for the effects of chiropractic care. In this workshop, we will review the time-series design and its previous application in chiropractic studies. Of particular interest will be the types of measures used, methods of controlling bias, and repeatability of measures. Methods of data collection and analysis will be demonstrated along with manuscript preparation and publication of the work.Several of the presenters at this years National Subluxation Conference will present, or have published studies using this methodology. They will be engaged in discussion to provide their experience regarding how the research projects impacted or enhanced their practices. USING CHIROPRACTIC ATLAS ORTHOGONAL TECHNIQUE(AOT)STRUCTURAL SUBLUXATIONS CAUSED BY ATLAS KINEMATIC DISPLACEMENT(AKD) Roy W. Sweat, D.C.., B.C.A.0. Matthew H. Sweat, B.A. D.C.,B.C.A.0. McKnight M, DeBoer KF. Preliminary study of blood pressure changes in normotensive patients undergoing chiropractic care. J Manipulative Physiol Ther 1988; 11:262-6. Tran TA, Kirby JD. The effects of upper cervical adjustment on the normal physiology of the heart. J Am Chiro Assoc 1977; 11:58-62. Yates RG, Lamping DL, Abram NL, Wright C. Effects of chiropractic treatment on blood pressure anxiety: A randomized, controlled trial. J Manipulative Physiol Ther 1988; 11:484-8. Plaugher G, Bachman TR. Chiropractic management of a hypertensive patient. J Manipulative Physiol Ther 1993; 16:544-9. Plaugher G, Meeker W, Shelsy A, Lotun K, Jansen R. Randomized clinical trial of chiropractic adjustments and brief message treatment for essential hypertension: A pilot study. Conf Proc Chiro Cent Found 1995; Jul:366-7. Mootz RD. Conservative management of patients with mild hypertension. Top Clin Chiro 1995; 2:37-44. Hood RP. Blood pressure: Results in 75 abnormal cases. Dig Chiro Econ 1974; 16:36-8.